Αcrylic on canvas, 146x114cm, 2012. Marcello Petisci is a Belgian painter whose hyperrealist paintings mesmerize with their meticulous attention to detail, unfolding narrative and emotive depictions. 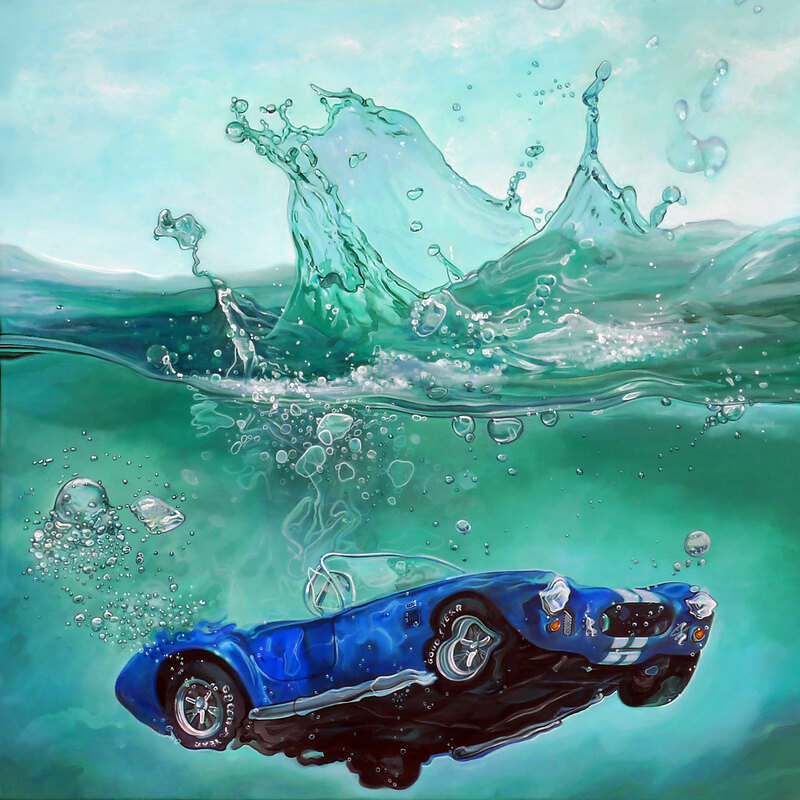 His canvases, which often portray vintage cars in unconventional situations, succeed in appearing both real and fantastical, like snapshots from a dream. Acrylic on canvas, 130x97cm, 2014. Acrylic on canvas, 97x97cm, 2015. 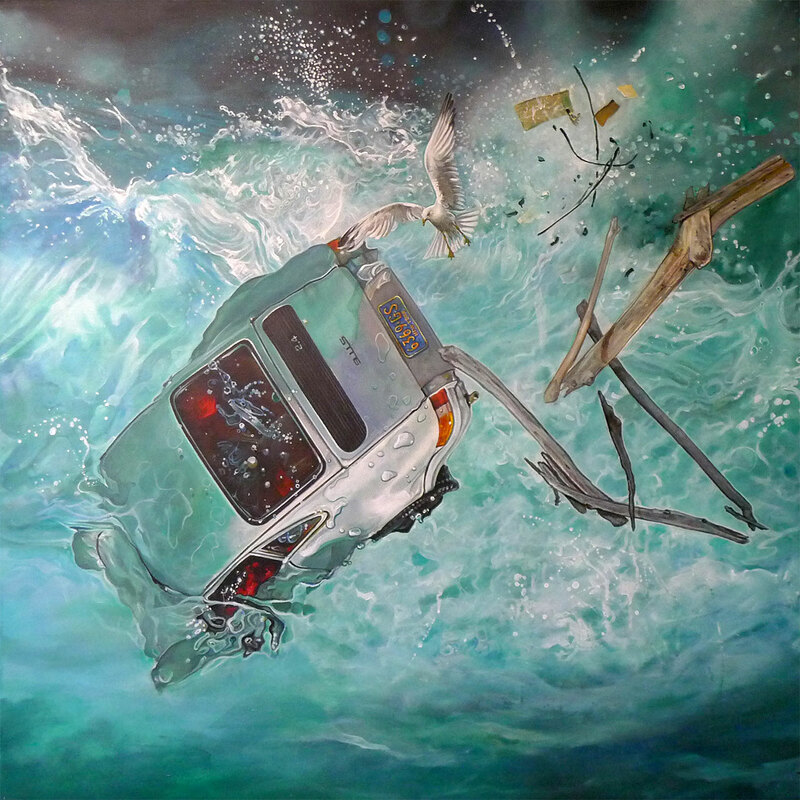 Petisci started his career as an illustrator in advertising where he found his hyperrealist painting skills in demand when photography was inadequate for product enhancement before eventually becoming a full-time painter in 1990. Eschewing human forms for inanimate objects, Petisci draws on his particular fascination for vintage cars (whose illustrations he used to copy as a child long as he remembers and now loves to drive). Αcrylic on canvas, 100x90cm, 2014. Depicting them in dream-like sequences, often submerging them partially or fully in water, the cars, be it a flashy 1960s Ferrari GT model or a more humdrum Fiat 500 mini, are fledged out in great detail. Staged as still frames from an action film, some more tense and some more placid, the paintings allude to an underlying cinematic narrative and demand that the viewer consider both what may have preceded the scene he/she is watching and what may happen next. Each composition is carefully planned with each element purposefully selected and strategically placed in relation to the others. In what is a laborious, time-consuming process, the reference image is initially drawn with a pencil onto the canvas, before - using acrylic glazes which dry very quickly - colour is applied in numerous painting sessions, segment by segment, layer upon layer. Hyperrealism is a progression of photorealism that emerged in the 2000s as digital cameras and extremely high-resolution imagery displaced analogue photography. 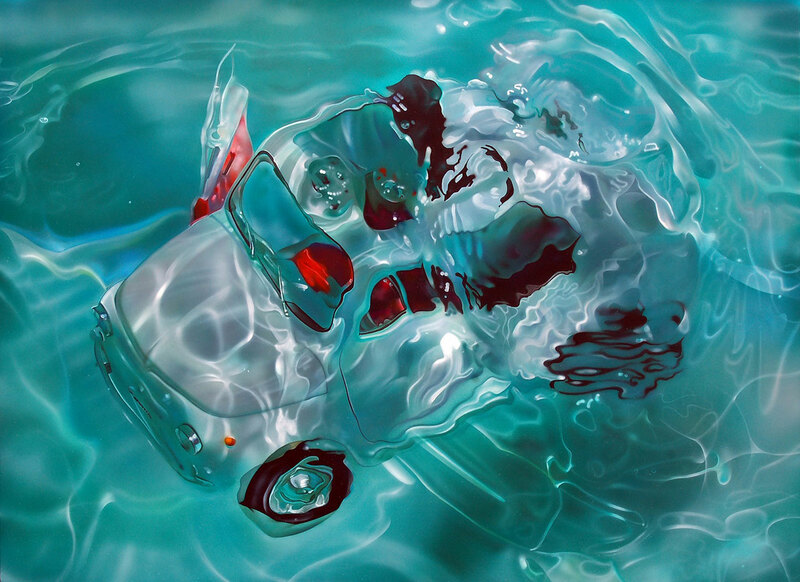 Hyperrealist paintings, with their emphasis on details and subjects, tend to create a convincing illusion of reality that does not or could not exist outside of the artist’s mind. 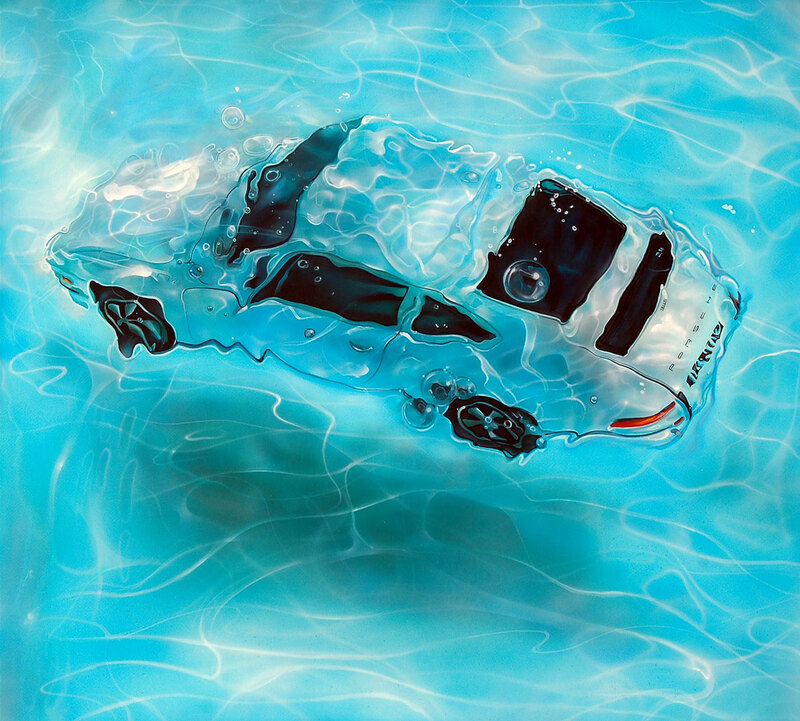 In the case of Petisci’s paintings, this sense of hyper-reality is heightened by visual layering where the immaculately detailed cars are enveloped in superbly executed elaborate reflections and refractions enabled by water or glass—another prominent prop in the artist’s paintings. 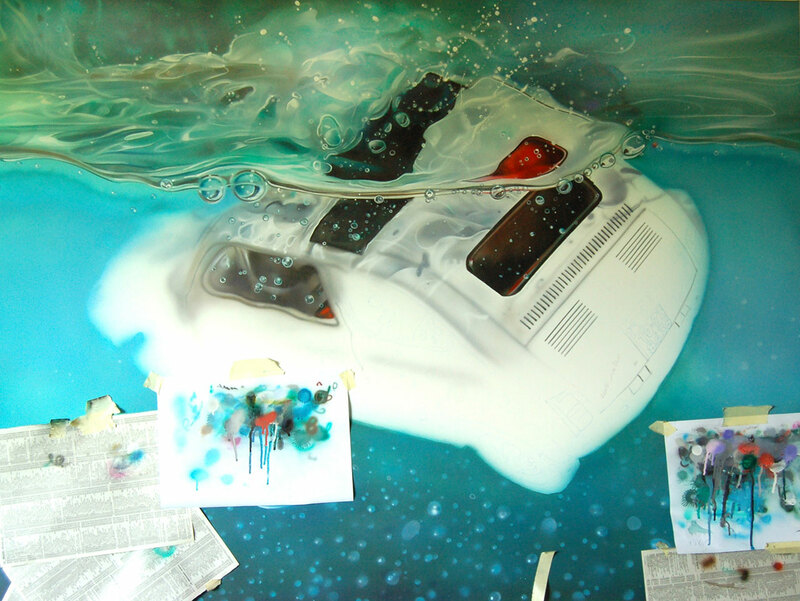 Inspired as he says by “the sum of emotions that he collects during his life” and his country-side residence that allows his imagination to turn “a stream into a torrent”, Petisci’s paintings transform the surreal into the tangible.